More than 141,000 girls in all Welsh primary and secondary schools will be given access to free sanitary products under Welsh Government plans. Ministers have set up a £2.3m grant for councils to fund the scheme. The move aims to tackle period poverty - where women and girls find it too expensive to buy sanitary items. It follows similar moves to roll out free products at secondary schools in England, and to offer them to patients in the Welsh NHS. Campaigners say young women and girls find themselves missing school because they cannot afford the items. First Minister Mark Drakeford announced the cash, to be made available to councils immediately, at Welsh Labour conference on Saturday. "It's unthinkable that young women could be forced to miss days of their education simply because they can't access or afford period products," said education minister Kirsty Williams. The move was welcomed by Hilary Beach, who has campaigned on the issue in Chepstow where she is a town councillor. She founded an effort to offer "dignity bags", encouraging members of the public to donate sanitary products to be redistributed to women-in-need. "There's a certain amount of period poverty in Monmouthshire," the town councillor said. She said education of some young women suffers "because they are not able to fully participate when they have got their periods," she said. The Welsh Government announcement was "tremendous news", she added. Last year £700,000 was provided to boost school toilet facilities, and £440,000 to allow councils to provide products through schools, food banks and shelters to those who otherwise may struggle to afford them. 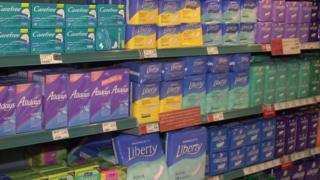 Rhondda Cynon Taf last year announced it would offer free sanitary products to all school girls in the council area. Mr Drakeford told conference that colleges would also benefit - full details were not provided at the time of the announcement on Saturday.